Benefits: Spa Milk Salt is a skin whitening, enriched Vitamin E, pure milk and natural salt benefits. It provides nourishment to your skin with pure Milk Derma White and Allantoin. It removes dirt deposit and dead skin cells from your body, giving you a new and radiant skin. Direction: Pour spa salt on your hand. Rub gently in circular motion on wet skin. Leave it on your skin for 3 minutes and then rinse off with clean water. After use, you can feel your skin’s softness and smoothness. 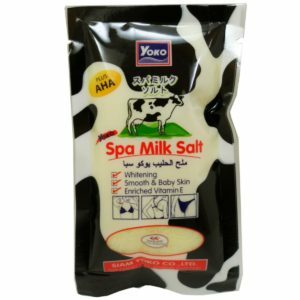 Yoko spa milk Salt is a skin whitening, enriched Vitamin E, Pure Milk and natural salt benefits. It provides nourishment to your skin with pure milk Derma White. It removes dirt deposit and dead skin cells from your body, giving you a new and radiant skin, soft and smoother. How to use : Pour spa salt on your hand. Rub gently in circular motion on wet skin. Leave it on your skin for 3 minutes and then rinse off with clean water. After use, you can feel your skin’s softness and smoothness. Ingredients : Milk Protein, Sodium Sesquicarbonate, Sodium Chloride (NACI), Glycerine, Sodium Lauryl Ether Sulphate, Perfume, Olive Fruit Oil, Vitamin E, CI 19140, CI 15985.